The Passover Seder plate, as shown in this March 8th, 2007 photo, is a special plate containing symbolic foods used by Jews during the Passover Seder. The items include (from top center): horseradish; a shank bone; a mixture of fruit, wine and nuts. This weekend some Americans celebrate the Christian holiday of Easter, while others will celebrate the Jewish holiday of Passover. Easter is when Christians celebrate the life of Jesus and what they believe was his return from the dead. For most Christians, Easter this year is on Sunday, April 5. Jews observe Passover, or Pesach in Hebrew, this year from April 3-11. Passover celebrates the Jews' escape from slavery in Egypt. The Jewish holy book, the Torah, tells about how Moses led the Jews to freedom. A special dinner, the seder, begins the celebration of Passover. Matzo is a staple at all seders. The unleavened bread reminds those at the seder that their ancestors did not have time to let their bread rise before fleeing Egypt. Jewish families get together and eat foods that represent the Exodus story. 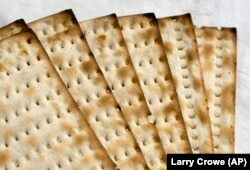 One food is matzoh, a flat, crisp bread. It represents the hurry linked to the slaves’ escape. They did not have time to let their bread rise before baking it. Another special food on the seder table is maror, bitter herbs. They represent the pain of slavery. In America, many children are told stories about the Easter Bunny. He is said to hide eggs, chocolates and other sweets, for children to find on Easter morning. The Easter Bunny tradition probably developed from a German celebration of spring. Germans first settled in North America in the eighteenth century. Eggs are an almost worldwide symbol of fertility and renewal. ​Individual families often organize Easter egg hunts. But egg hunts can also be public gatherings. Every year, on the Monday after Easter, the U.S. president holds an event called the White House Easter Egg Roll. This is the 137th year the White House has held the event. The President and his wife invite hundreds of children to the White House. They join the children in hunting for eggs, playing games, and reading stories. Many Christians in America attend religious services on Easter Sunday. Often, these services take place at sunrise. One of our French readers tells VOA about an Easter tradition in France, where many Roman Catholics live. Churches in France do not ring their bells on the two days before Easter Sunday. The bells are silenced in respect of the death of Jesus. They ring again on Easter Sunday, the day Christians believe he came back to life. French children are told a story about why the bells are quiet on Friday and Saturday. Parents say the bells have flown to Rome to see the head of the Roman Catholic Church. But on Sunday morning, the bells return and ring again. The Greek Orthodox Church celebrates Easter on April 12 this year. Orthodox Christians in America celebrate by blessing food baskets. In Greece, people color hard-boiled eggs and play a game by knocking them together. They eat lamb and party into the late night. The Persian New Year, acknowledged by the United Nations as the International Day of Nowruz, was on March 21 this year. This holiday marks the first day of spring, or the Equinox. A “haft sin” table shows many symbols of spring and life on Earth. The table includes eggs, a live goldfish, sprouts, and other foods. No matter what your culture or religion, it seems we all love spring. It is especially welcome after a long, cold winter. In the United States, many cities saw record snowfalls this year which makes spring all the sweeter. This story was based on a story by Doug Johnson. Dr. Jill Robbins wrote this story for Learning English. Catherine Weaver was the editor. Note: Sunday April 5 is also Sizdah Be-Dar (Persian: سیزده به در‎, literally: 13th in outdoors) part of the Nowruz new year celebration rituals. It is a day to spend outside with one's family and friends. Families share picnics and eat foods like olivieh salad. Now it’s your turn. What celebrations of spring happen where you live? Write to us in the comments section.